Welcome to the Honda and Acura auto repair for Accurate Automotive, Nashville Tennessee’s premier source for Honda and Acura car repair service. At Accurate, we specialize exclusively in Honda and Acura automobiles. Every member of our technical staff is a former Honda or Acura dealership technician and thoroughly knows the Honda and Acura line of cars, trucks, SUVs and vans. 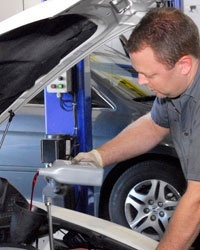 Whether it’s general Honda and Acura auto maintenance like brakes and oil changes, or mechanical issues that sometimes occur, for all of your auto repair needs, rest assured you can trust Accurate Automotive to perform the work right, in a timely manner, with great Honda or Acura customer service. Explore the site to find out more about the services Accurate Automotive offers for your Honda and Acura automobile, or to make an appointment. We want to take the worry out of the repair of your Honda or Acura car and save you money on that same auto repair that you would receive at your local Honda or Acura franchised dealership.